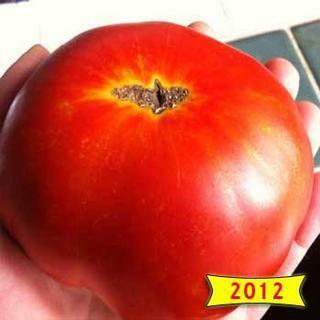 This wonderful tomato is the result of the breeding talent of Bill Jeffers. Dixiewine is a big red beefsteak that has to be tried to be believed! Heirloom Seed Packet. Last year I had this listed as Brandywine x Neves Azorean Red and pulled it because there was some concern on the internet that it may not be stable. I am very happy to offer it again with it’s new name, Dixiewine. This wonderful tomato is the result of the breeding talent of Bill Jeffers (complete story information can be found on Bill’s Create Your Own Heirloom Tomatoes page, along with some of his other amazing crosses ). I am in love with this big red beefsteak and it has been my favorite among hundreds of new grow outs for the last two years. It has to be tried to be believed and I can only tell you when you take your first bite, get ready for a big old taste party in your mouth!